Some foods are destined to be together: peanut butter and jelly, cream cheese and guava jelly, and pork and sauerkraut are just a few. It's no wonder there are so many pork and sauerkraut recipes to choose from. Pork and sauerkraut is often eaten on New Years' Day for good luck, but there are those who say any day that you are having pork and sauerkraut for dinner is a lucky day. Most pork and sauerkraut recipes are braised. This means that the meat is seared in a pot or large pan and then the rest of the ingredients area added to the pork and the whole thing is baked in the oven. The searing adds texture and flavor to the meat but the cooking is finished in the oven so the meat doesn't dry out and the flavors get a chance to mingle. You will need a Dutch oven to braise the pork chops but a 12-inch cast iron pan with a lid will work just as well. In fact, if you have an oven-safe large pot with a lid, you can use it rather than go out and buy a new Dutch oven. Most pork recipes will use applesauce or brown sugar or both because these ingredients enhance the flavor of the pork. This recipe uses both. Note: You can add the caraway seeds to the recipe whole, but you will get the best flavor out of the seeds if you crack them first. A mortar and pestle works best for this but if you don't have a mortar and pestle handy, you can briefly grind them in your coffee grinder. Other than that, you can place the seeds on a cutting board and run your rolling pin over them a few times. If all this seems like too much trouble, just use the seeds whole. Heat the 2 tablespoons of oil over a medium heat. Add the onions and minced garlic and cook for about two minutes. Add the pork chops and brown on both sides. Take the pork chops out of the Dutch oven and add the applesauce, sauerkraut, brown sugar, caraway seeds, and pepper. Let this cook, stirring occasionally, until the brown sugar has melted. Add the pork chops back to the pot and stir so that the chops are covered with the sauerkraut mix. Bake for 30 minutes and then test for doneness. When the pork chops are tender and cooked to 160 degrees, they are done. This recipe uses a large pork shoulder. The sauerkraut is added in batches to give the dish different textures. Prepare the pork shoulder by rinsing it in cool water. Sprinkle the cinnamon, caraway seeds, and salt and pepper over the pork. Place the pork shoulder in a roasting pan on a rack and cover the pork with 1/3 of the sauerkraut. Pour 1/3 of the sauerkraut juice into the roasting pan. Cover the roasting pan with foil. Roast the pork shoulder for an hour and a half. Add another third of the sauerkraut on top of the pork and cover again. 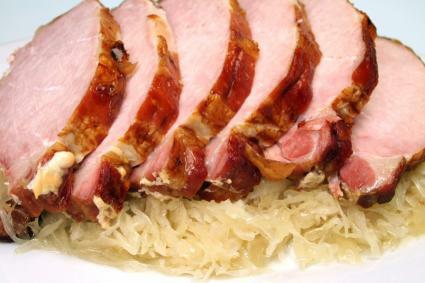 After an hour of cooking, place the last third of the sauerkraut over the pork and cover again. Bake for one more hour. When the pork has been cooked to 160 degrees, it is done. Potatoes are a great side dish for pork recipes. Loaded mashed potatoes really make this recipe shine, but you can go with a gratin or steamed new potatoes. I have served this with a baked sweet potato and broccoli.